Tourists in Australia should be careful around kangaroos - especially if they are eating carrots. 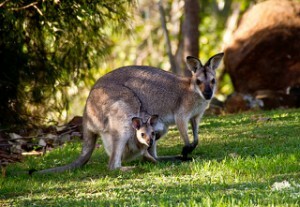 Kangaroos in Morisset, New South Wales have started attacking visitors to get to their food, leaving some people with serious injuries. The problem is not with the kangaroos, but with tourists who want to take "kangaroo selfies" to post on social media. Tourists get close to the wild animals by giving them food and carrots are their favourite. Now kangaroos get angry when they are not fed and will kick or scratch people to get the food. Local MP, Greg Piper, thinks that tourists need to be educated. "Kangaroos are cute but they are also capable of inflicting injury." This entry was posted in Animals, General. Bookmark the permalink. The MP is right. Tourists need to be educated!!!!! It’s very cute!! !But it’s very Dangerous!!!! YOU CAN’T SAY THAT FROM THE KANGOUROUS!!!!!!! THE HUMAINS STARTED IT WHITH THEY PHOTOS!!!!!! !